The new full-length from the UK ska band The Talks is something I’ve been looking forward since I heard their West Sinister EP last year. 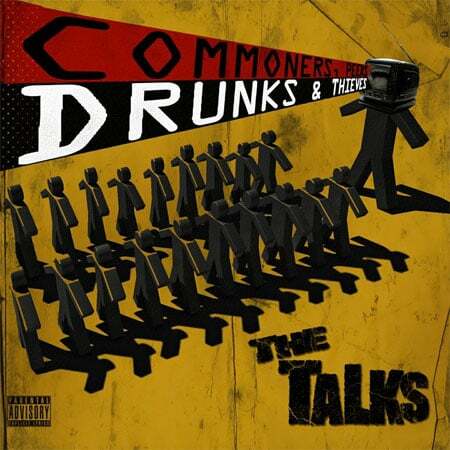 Commoners, Peers, Drunks and Thieves is everything I hoped it would and then some! Commoners, Peers, Drunks and Thieves buzzes right out of the gate and as soon as you hear the keys on “Don’t Look Behind You,” you’ll want to dance. This is bouncy ska at its finest! This was The Talks’ first single off the new album I believe and it’s one of my favorites off this album. The second single is the second track “Radio.” It has more of a reggae/ska feel than a punk influenced ska song. Either way, both songs are catchy as hell. “Fire” has some impressive guitar playing on it and “Light Up” is a poppy ska tune that is similar to “Radio.” Out of all the songs on the new album, “All In A Day” is my favorite. It’s the catchiest, and just sounds the best to me. It’s a track I just keep listening to over and over. If they were going to do another single, I think that one is it. Towards the end of the album, the song “Sam” features t-bone playing by Dr Ring Ding. It’s weird, I thought I’d hear Dr Ring Ding sing on the track instead of him just playing the trombone. In any event, still very cool! Most of the album is brilliant but there’s a couple of tunes I just didn’t like as much as the others. That’s always the case on most albums from any band. The overall sound of the Talks reminds me of the 2 tone ska of the 80s like The Specials and Madness. There is a variety of ska styles on this album. Basically, it’s got everything for everyone (who’s into ska music). I honestly think they are one of the best new UK ska bands out there and really hope they come play the United States at some point. Fans of 2 tone and ska music should definitely look into this band! Bottom Line: Awesome new full-length from the Talks!